‘Women of Letters- Reviving the Lost Art of Correspondence’ – Curated by Marieke Hardy & Michaela McGuire 2011. This book is all about reviving the art of writing letters, the art of sharing stories in more than 140 characters, perhaps even the art of living and appreciating life enough to fill this space. This is also a book filled with the lives of amazing Australian women, so this post is for my aunt Rachel, who is the bravest woman I know. ‘Women of Letters‘ began as a creative fundraising event for Edgar’s Mission animal rescue centre and has grown into a monthly event, with an online community, and of course, the book which I just read. Hardy and McGuire invite talented musicians, actresses, politicians, writers and comedians to write a letter to topics as varied as ‘the moment it all fell apart’ or ‘the best present I ever received’ and in the process revive the lost art of correspondence. At the monthly events, these writers then read their letters aloud to an audience, which lends a very intimate quality to the letters in this book, as each has a very distinct ‘voice’. This is a difficult book to comment on, as there are so many styles, and vastly different approaches to writing letters. But this is it’s strength. It is a brilliant book to read a little at a time, I picked it up and read a couple of letters here and there, rather than from start to finish. Some of the letters were very candid, other were hilarious, and out of all the letters there were only two that I didn’t like (and one of those was written by Paul Kelly). I must admit that there are two things about this book which I would usually dislike. First is the ‘celebrity factor’. Ever since I read a social science text with an infuriatingly pretentious introduction by Bono I have shied away from any kind of ‘non literary’ celebrity association. However, in this case I am willing to overlook this, because seeing Megan Washington‘s name was actually what made me pick up the book, and give it a proper look, rather than just a cursory glance. In addition, the actual idea behind the fundraising is based around famous Australia women, as so it isn’t some tacked on celebrity endorsement. Secondly, as any frequent reader of this blog will probably have noticed, I’m not really a reader of ‘current’ books. Those books that dominate newspaper columns and ‘recommended this Summer’ lists before falling into obscurity as mediocre. I had seen this book mentioned in a few Sunday newspaper reviews and there was a huge in store display, but I’m glad I swallowed my prejudices and gave it a try. 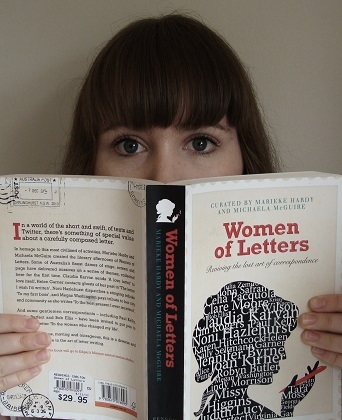 ‘Women of Letters’ is something truly unique and well worth a read, it might even prompt you to see your own life in a different light. ‘The Handmaid’s Tale’ – Margaret Atwood 1985.